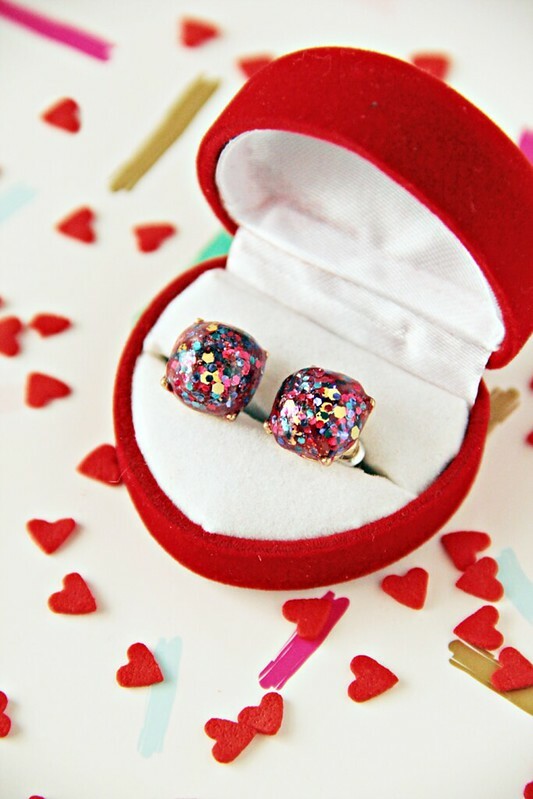 These DIY Kate Spade Glitter Earrings are a project I’ve wanted to undertake for two years now – two whole years! The backstory is that three years ago, my eyes landed on the originals around the holidays and I put them at the top of my Christmas list for all to see. Though I received some absolutely wonderful presents that yea, as I do every year (thanks, fam! 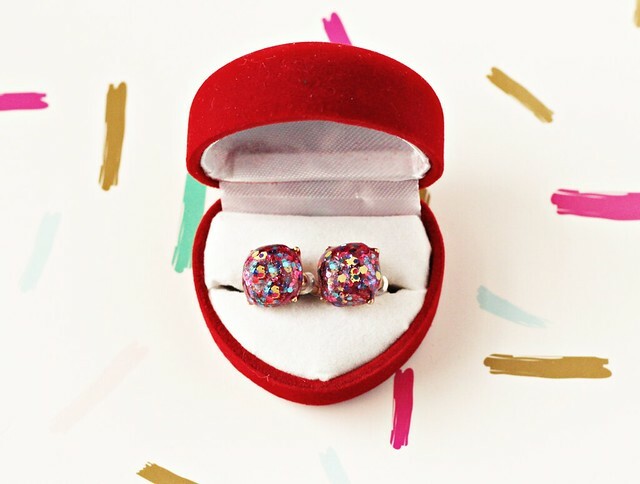 ), these multi-color glitter studs weren’t waiting for me under the tree. “Not to despair!” I told myself, “If not Christmas, then Valentine’s Day!” But many others shared my delight with them and they were sold out everywhere by the start of the new year. Insert: sad trombone. I searched high and low for over a year with no promise of a return in sight, so I planned and I schemed on how I could recreate them – I just needed the perfect base earrings to build my shimmery beauties. You know how it goes though, life happened and other projects emerged and my idea for the recreation sat idling on the back burner. But finally, in December of this year, I took the bull by the horns and bought a pair of matte faux stone studs for $3.51 from Forever 21 and began auditioning my treasure trove of glitter nail polishes for a good combination. I wanted pink to be more present in my pair than in the originals. I mean, if I had creative control of this process, I thought that I might as well shoot for the moon! I settled on some complimentary glitter polishes that I already owned – namely, Sally Hansen’s Cheery On Top and China Glaze’s Shine-nanigans, which has a lot more depth and pinkness to it than the photo below would suggest. 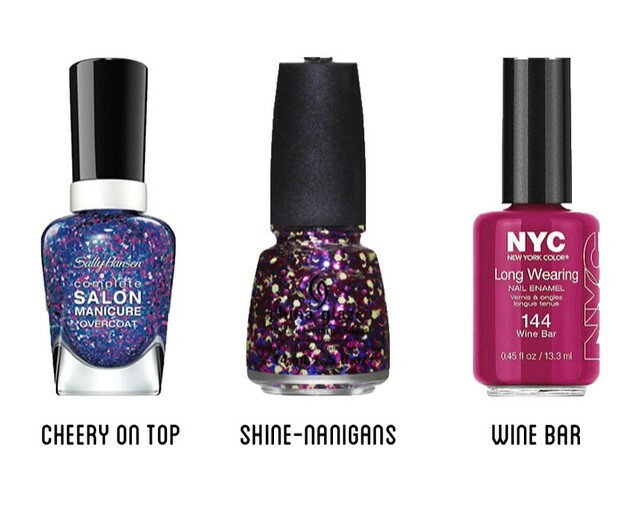 I also selected New York Color’s Wine Bar to up the magenta quotient by using it as a background color to the glitters; I applied it as a base coat since the earrings I upgraded were grayish white. These DIY earrings require a little patience, as it pays to let the layers of color and glitter set up a bit before applying the next coat. I used a small stiff angled brush to more aggressively push the glitter around to the spots I wanted it and, at the end, I also used it alongside some cotton swabs and nail polish remover to clean up the areas where my handiwork got a little messy. I sealed the earrings not with clear top coat, as one might be tempted to do considering we’re working with a lot of nail polish here, but rather with this amazing glaze by Americana. It took about 24 hours to fully cure, but it gave the earrings a smooth, slightly domed finish just like the originals and also imparted some really great shine. For those of you prepared to leave me a comment letting me know Kate Spade went and did a girl a solid and re-released these opulent little gems this past holiday season, I know! But I have to be honest: for less than a third of the original price (way less if you use nail polish you already own or repurpose an old pair of earrings), I think this DIY version is a pretty fantastic dupe! Within minutes of wearing them out into the world for the first time, I got three sets of compliments from three entirely different, unrelated people – that equals success in my book! 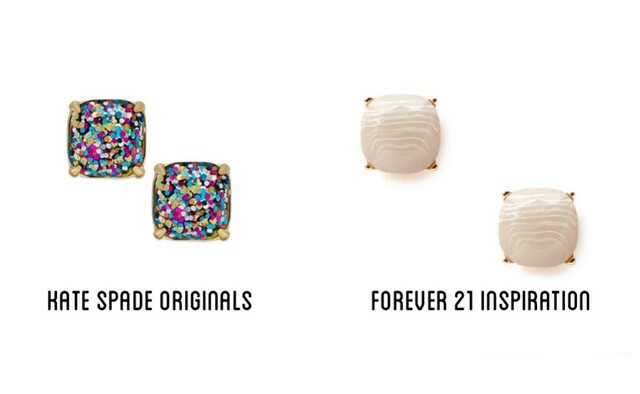 My only regret is not buying more pairs of the Forever 21 studs so that I could recreate these for all of my earring-wearing, glitter-loving Galentines out there – lucky for all of us, they’re still online here. Small miracles, I say! Remove your earrings’ backs and poke the stems into a piece of sturdy foam or stiff cardboard so that there is at least half an inch between the back of the earring and the surface of the foam/cardboard. This will help keep the earrings elevated and make them easier to maneuver and see all sides as you paint them. If your earrings are a light color or a color you dislike, use a nail polish or acrylic craft paint of choice to apply a thin base coat to the earrings. If you want one color in the glitter polishes to really stand out, choose this as your base color. I chose a magenta polish on my pair as the base. When dry, apply your first coat of glitter polish. Err on the side of lighter coats, of which you’ll need to apply several, as opposed to heavy, gloppy coats. The latter, obviously, takes more time to dry, but I also felt like I had less control over the distribution of the glitter when the top of the earring was overwhelmed by polish. The more lightly you apply the glitter polish, the less chance you’ll have of errant glitter getting stuck to the side and back hardware of the earrings. Repeat your coats of glitter polish using the stiff angled brush to manipulate the glitter into the patterns and positions of how you’d like it to appear. After you’ve applied your final coat of glitter – I used about 5 coats – allow it to dry and clean up any spots or splatter with some nail polish remover and either the stiff angled brush or a cotton swab. Next, apply the glaze. I was more heavy-handed with the glaze because I knew I’d only be applying one coat. Paint it on thickly and make sure the surface is smooth and completely covered. As the glaze cures it will, initially, turn opaque white and then, as it hardens, it will lighten until it eventually becomes a smooth, clear, shiny casing. It’s amazing how much this glaze took these from an obvious (but still pretty!) DIY to something that looks much more, well, polished!